• Enter Newcastle on the MEMEL rd. • Turn immediately left into IMPALA rd. • Continue along IMPALA rd, at the first robot turn left into VICTORIA rd. • Continue along VICTORIA rd, passing through one three way stop. • At the second stop turn left into PIKKEWYN st.
• Avalon Guest Manor is located on the corner of ALBATROSS st & LOERIE st.
• On the N11 turn left into Newcastle via ALLEN st.
• Follow ALLEN st, through Newcastle CBD passing Edgars and later the Spur & Engen Garage. • At the first robot, after the Spur, turn left into VICTORIA rd passing Amajuba Mall on your left. • Travel through three robots and one three way stop. 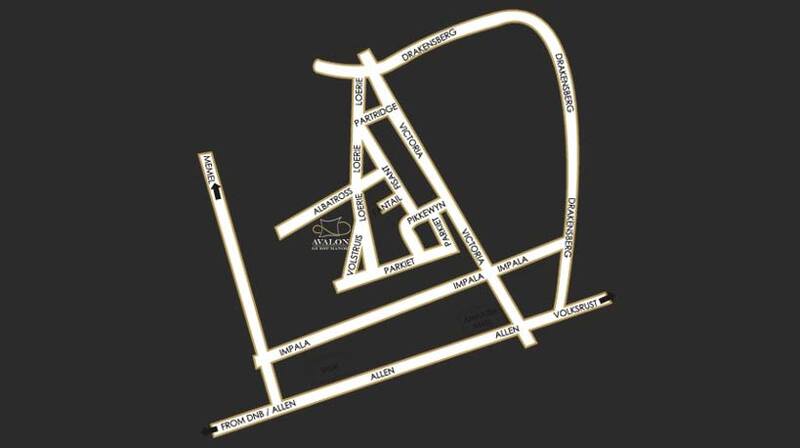 • Turn right into FISANT st, left into ALBATROSS st and left again into LOERIE st.
• Avalon Guest Manor is located on the corner of ALBATROSS st and LOERIE st.
• Enter Newcastle along the VOLKSRUST rd. • Continue along passing through the HJ VAN EKE & DRAKENSBERG robot intersections. • At the third robot turn right into VICTORIA rd. Passing the Amajuba Mall on your left. • Continue along VICTORIA rd, through three robots and one three way stop.